This picture depicts a panoramic scene with three lateen rigged vessels sailing on the water whilst seagulls hover around them. The vessel on the left of the picture has lowered her foreyard and you can see the sail billowing on the deck. The vessel in the middle has her two yards across the boat and is running before the wind (i.e. the wind is behind the ship pushing it along). It has been said that as the vessels are lateen the painting is possibly set in the Mediterranean rather than on a lake (1). However, ‘Vevey’ is written in the bottom left hand corner, along with the signature and date. This painting was first sketched, as under drawing can be seen to the left of the closest (largest) sailing boat, and then painted with watercolours. A buoy bobs about in the waves near the shoreline, which is just visible in the foreground, adding depth to the painting, whilst in the distance you can see a misty mountain range. 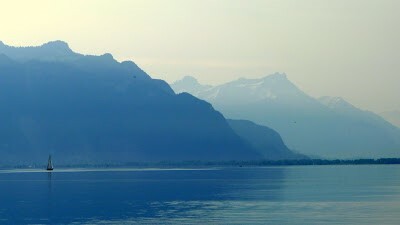 Writers, artists and intellectuals have long been attracted to Vevey, a town perched between one of the largest lakes in Western Europe, Lake Geneva (Lac Léman to the locals) and Mount Pélerin, Switzerland. Currently little is known about the artist, E Myers, but research is on-going. ​Coastal Scene with Shipping was painted in 1873, the same year that French Realist artist, Gustave Courbet (1819-1877), went into exile a couple of kilometres along the coastal road from Vevey, at La Tour-de-Peilz. He had been imprisoned for his political activities during the Paris Commune. 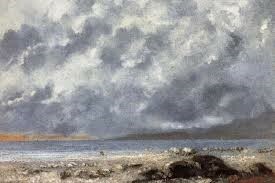 Courbet lived there until his death and painted views such as ​Beach Scene shown below. Gustave Courbet ‘Beach Scene’, 1874, oil on canvas, 38 x 55.5 cm (15 x 22.9 in), National Gallery, London (3).